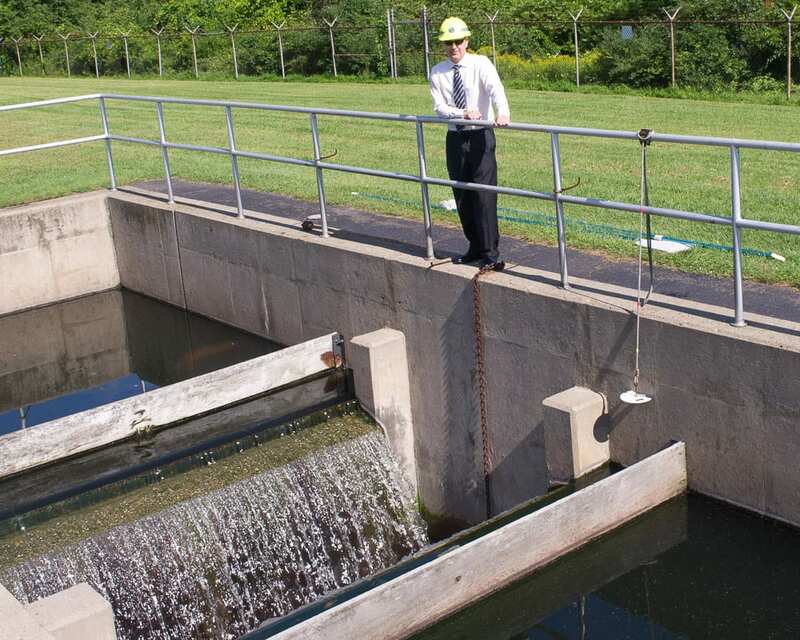 Chretien Voerg stands next to his favorite spot at the Mohawk View Water Pollution Control Plant, where clean water is discharged into the Mohawk River. Jim Franco/Spotlight News. COLONIE — The British Medical Journal asked its readers, mostly doctors and other health care professionals, what they thought was the most significant medical advancement since 1840, the first year the prestigious periodical was published. Readers submitted more than 100 impressive, monumental, Nobel-prize winning nominations that inarguably have made the world a better place. But, the hands down winner was … drum roll … sanitation. Nothing in the last 178 years has made our lives longer and better on this planet than the proper handling of waste. And on top of that broad spectrum of activity is the sanitary sewer system — that was first developed by Edwin Chadwick in the 1840s — and controlling all the germs and bacteria and other nasty things that thrive in human waste just waiting to make people sick. But, as explained by Chretien Voerg, superintendent of the Division of Pure Waters for the Town of Colonie, it’s not as simple as flushing a toilet. And far more complex than flushing a toilet and just discharging it into the river. The days of “the solution to pollution is dilution” are in the past, an infinitely better spot than today. When a toilet is flushed, or a washing machine drains or a shower is taken, the waste water enters a complex system that includes 400 miles of pipe and 30 pumping stations. Gravity is the main force behind getting waste water to the plant, but since there is a cost-benefit factor that needs considering when digging pipes too deep, at different locations waste is pumped back up to a point where gravity can again have an opportunity to work its natural-law magic. Once it does come into the plant, on Onderdonk Avenue, a dead end road in a remote part of town along the Mohawk River, that is where common sense and science take over. First, Voerg said, since gravity got it there, the main pumping facility has to get the between 3.5 and 4 million gallons of waste water a day back up some 50 feet to ground level so it can be properly processed. The next step is “raking” the solid material that does not degrade and/or cannot be broken down and probably should not have been flushed in the first place. Things like rags, baby wipes, coffee grinds and egg shells routinely end up in the sewer system instead of the trash and ultimately end up in the landfill anyway, Voerg said. This is just a more expensive route and can be even more expensive if it damages the sewer system’s infrastructure. The next step is a clarifier, or a large vat with a large spinning arm, that allows whatever waste that can settle to bottom on its own a place to do so. But, invariably, some of the waste dissolves and within that cloudy, brown liquid are viruses, bacteria and other microorganisms that can cause such things as dysentery, cholera, typhoid and hepatitis that have to be neutralized before the water is considered clean enough for a return to the environment. To do that, the plant facilitates the growth of bacteria by exposing it to aeration. It’s a similar process to growing bacteria in the gravel of an aquarium to break down toxic fish waste. “What we do is leverage the bacteria inherently in our bodies by giving it air and we use those microorganisms to degrade the waste even further,” Voerg said. Once it passes through that, the microorganisms that were so helpful in breaking down the waste, need to get filtered out in another vat, with some being captured and disposed of along with the rest of the sludge and some used to seed a new batch. Once it passes through that stage, the water is chlorinated as a safety measure and piped into the Mohawk River. Like everything at the plant, it’s a matter of balance: you need enough chlorine to kill the bacteria but too much can harm environment before it is diluted by the Mohawk River waters. On average, some 20 tons of sludge are collected a day from the plant during any given work week — or about one truck load — and hauled off the landfill on Route 9. The sludge weighs so much because, despite all efforts to wring as much water out of it as possible, it is still about 20 percent solid and 80 percent liquid. And the waste is still very “bio-active,” Voerg said. Voerg is quick to tip his hat to the “visionaries,” those who came long before his 20-year tenure with the town began for not only establishing the system with two sets of pipe — one for storm water and one for waste water — but for also incorporating the entire town into one sewer district. Many river communities have a single-pipe system to collect storm and waste water. They are, collectively, looking at a multi-billion consent order by the state Department of Environmental Conservation to install new, separate lines because when there is a large storm, raw sewage still, in 2018, ends up in the river. He also credited Gov. Nelson Rockefeller for the 1965 Pure Waters Bond Act, a $1 billion state backed bond to build municipal wastewater treatment facilities. In the 1950s the Town of Colonie had individual sewer districts, Voerg said, and a lot of the raw sewage was flowing right into the river. Now, the town’s system has 25,000 connections and the majority of the developed parcels in the town are serviced by either the facility on Onderdonk or Albany County’s facility in Menands. The department’s capital budget is $3.3 million and it has an operating budget of $6.5 million. A typical single family home pays $258 a year for sewer service. Eight people run the highly automated plant 24 hours a day, seven days a week, 365 days a year with another 15 in the field to maintain the pipes and pumping stations. As with every upstate community, Colonie’s infrastructure is older and is an issue. In an effort to minimize the impacts of that issue, the department has a camera that runs through the pipes on a near continuous basis to see where weak spots are or where they may develop. Voerg said to repair or replace a section of pipe before it bursts costs about $300 a foot compared to $1,300 a foot after one blows out. But, just because it fits doesn’t mean it’s supposed to go there. The town’s sanitary sewer system has separate pipes from its storm water management system, and toilets can only handle things that are so big, but the crew at the Mohawk View Water Pollution Control Plant does find some odd ball things that have been flushed. Money, for some reason, and prison shanks presumably from inmates at the Albany County jail. “When there is a shakedown at the jail we find these balls of bread that are used to make homemade hooch,” said Shane Brino, the sewage treatment plant operations supervisor, adding once an entire prison jumpsuit somehow made its way through the eight-inch lines without getting stuck. Grease and baby wipes are probably the biggest culprits. Grease cannot be broken down and has the capacity to gum up the works. Voerg said there is an education-based program for restaurants, some of which generate large amounts of grease, but with 25,000 individual hookups feeding into the town’s sewer system, it is hard to reach everyone. Baby wipe companies claim their product is flushable, and it is accurate according to the definition above, but wipes cannot be broke down either and are physically removed at the plant, along with other fabric, and it all ends up in the landfill anyway. It’s just a much more expensive process. Years ago, it all just ended up in the river.